There's nothing that makes a home more appealing than a good smell! Nice home scents can add wonderful appeal especially around the Holidays. Here are some popular options. Candles are classy and decorative. For atmosphere and scent, light candles at the dinner table when you have guests, or in other rooms when entertaining. Prices vary, but you get what you pay for. Quality candles have long burn times and long lasting scents. Cheap candles burn quickly and may not even have a smell after the first few minutes. "Cheap" doesn't always mean in dollars and cents, either. Unless the candle is made by a local, known craftsperson, go for the name brands. They're simply better quality. 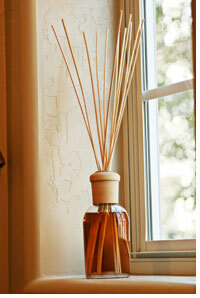 Another way to add a pleasant fragrance is to use spray air fresheners. They work quickly and do a good job in an enclosed environment, but they don't add a classy touch. Unlike candles that are perceived to add ambience, freshener sprays are perceived to cover up. Other air fresheners, like solid sticks and plug-ins that use heat to disseminate scents, are not noticeable and if used constantly, they keep a low, but permeating level of scent in a room. If you want your home to smell of a certain fragrance all the time, and you especially want that fragrance to greet you when you return home from work or other outing, these "always on" fragrances are the best choice. Potpourri is slower acting and is seen as more natural, although the exact chemical scents can be used in both commercial potpourri and solid air fresheners. The perception of "natural" comes by way of real potpourri, which is a mix of flowers, buds, seeds, leaves and twigs that have naturally occurring scents. The potpourri that you buy nicely packaged may have some natural scent, but it's nearly all "helped" by adding other ingredients. All scents, no matter what form they're in, that are sold as air fresheners can trigger asthma and allergy attacks, so go for quality natural ingredients when deciding what you'd like to use. If you have sensitivities to synthetic fragrances, here is an inexpensive way to use essential oils to make your home smell delightful. Put 15 - 20 drops of essential oil into a half cup of dry rice. Shake, or stir to mix it up. Put the rice in a small glass dish and place it in an out of the way spot. The fragrance will fill the air. Add more essential oil when the scent fades. Be sure to keep the rice out of reach of small children or pets who might try to eat it. Citrus and clove oils are some of the most popular for this type of air freshening. During the Holiday Season, pine, cinnamon, cloves, and vanilla are warm, comforting scents for your home. In areas of higher humidity and warmth, like the bathroom, use a spray bottle with water and eucalyptus for a clean fresh scent in the air.